All Web addresses mentioned were functional as of 4-22-16. From the Cumberland Gap to the Atlantic Ocean, this is Virginia Water Radio for the week of April 25, 2016. Those buzzing sounds open an episode on a familiar winged, six-legged animal that relies on water evaporation in its feeding, life cycle, and home maintenance. Have a listen for about 15 seconds to a large group of these creatures, and see if you know what they are. And here’s a hint: this society runs on hard workers with a sweet side. If you guessed honeybees, you’re right! You heard sounds from honeybee hives at a residence in Blacksburg, Va. Honeybees in North America occur as many varieties of one non-native species that was introduced to this continent in the 1600s. Honeybees are justifiably famous for their role as pollinators, joining many other native bee species in accounting for billions of dollars of value annually in pollination of food crops and other native and domesticated plants. Honeybees are also well-known for living in colonies with a definite social structure, including a queen, drones, worker bees with different roles, and developing young. Water evaporation plays a key role in the feeding of those young and in maintaining the colony’s temperature. Producing honey to feed developing larvae requires foraging bees to gather nectar from various plants and then to evaporate a large percentage of water in the nectar to make a much more concentrated solution of water and sugar. Bees accomplish this water evaporation by repeatedly moving regurgitated nectar over their tongue. Meanwhile, bees and other hive insects use the heat-absorbing effect of water evaporation to keep hives from over-heating. Water collected by foraging workers is placed in the hive, and then other workers fan their wings to increase evaporation, taking away heat in the water vapor. Notable for pollination, honey, and social structure, honeybees also deserve a little buzz for demonstrating some fundamental chemistry and physics of water. The bee sounds heard in this episode were recorded on the Virginia Tech campus in Blacksburg on March 23, 2016, and April 20, 2016, and at honey bee hives in Blacksburg on April 21, 2016. Thanks to Taylor Richmond and Stephen Schoenholtz for their help in recording sounds. 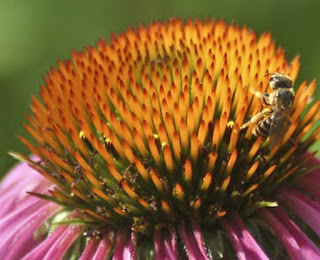 Honeybee (Apis mellifera) on Purple Coneflower (Echinacea purpurea) in Hadley, Massachusetts, June 2010. Photo by Jamie Weliver, made available for public use by the U.S. Fish and Wildlife Service's National Digital Library, online at http://digitalmedia.fws.gov, accessed 4-22-16. Virginia Water Radio host Alan Raflo recording honeybee sounds in Blacksburg, Va., April 21, 2016. Photo courtesy of Stephen Schoenholtz. Larry Connor, American Bee Journal Web site, “Beeswax” (August 1, 2015), online at http://americanbeejournal.com/beeswax/. Eric Day, “Native and Solitary Bees in Virginia” (May 2015), online at https://pubs.ext.vt.edu/ENTO/ENTO-151/ENTO-151.html. Iowa State University Department of Entomology, Bug Guide Web site, “Species Apis mellifera—Western Honey Bee” (March 2004), online at http://bugguide.net/node/view/3080. Susan W. Nicholson, “Water homeostasis in bees, with the emphasis on sociality,” Journal of Experimental Biology, Vol. 212 (2009), pp. 429-434. University of Florida Entomology and Nematology Department, Featured Creatures Web site, “European honey bee” (August 2013), online at http://entnemdept.ufl.edu/creatures/MISC/BEES/euro_honey_bee.htm. Virginia Tech Insect ID Lab, “Identification of Bees and Wasps,” online at http://www.insectid.ento.vt.edu/insect-id/identify-pests/adult/bees/. White House Office of the Press Secretary, “Fact Sheet: The Economic Challenge Posed by Declining Pollinator Populations” (June 20, 2014), online at https://www.whitehouse.gov/the-press-office/2014/06/20/fact-sheet-economic-challenge-posed-declining-pollinator-populations. Wasps – Episode 276 (7/27/15). A previous episode on temperature regulation (including bee sounds) is Episode 309 (3-28-16). This episode may support various Virginia’s 2010 Science Standards of Learning (SOLs), but the content level seems most appropriate for the following three. LS.6 – ecosystem interactions, including the water cycle, other cycles, flow of energy and matter, food webs. LS.7 – population interactions, including competition, cooperation and social hierarchy. BIO.4 – life functions (including metabolism and homeostasis) in different organism groups.